Whenever I’m working on a story that’s part of a series, I try to keep in mind the characters I may need for future books. This usually requires some planning on my part. Often times, I create a character with just a few vague details so that I have room to play when he or she shows up in a book later. 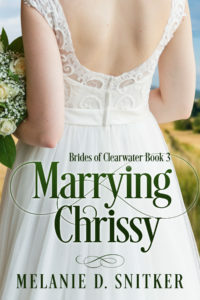 I just finished writing Marrying Chrissy this month (the third book in my Brides of Clearwater series). I knew I was going to create Chrissy’s sister, Emma, as a potential future heroine in her own book. What surprised me is that Wyatt’s sister, Bonnie, also became very real and is insisting on her own book as well. I love it because both characters already have a lot of depth and an amazing story that begs to be told. I think the hardest thing will be figuring out which one to write first! Emma – She’s dealt with illness most of her life. As a child, she was sick a lot, and this only got worse as she got older. She had heart problems that continued to get worse until a heart transplant was her only option. After praying and waiting for what felt like forever, the loss of someone’s loved one meant saving Emma’s life. It’s been over a year since her heart transplant. She’s thankful to be alive, even if life is still far from easy. Emma’s certain that no man will ever want her. Between the scars from the surgery and her continuing health concerns, it’s a lot for any guy to take on. Can someone show her just how strong and beautiful she really is, both inside and out? Bonnie – She was raised in a very wealthy home by parents who focused heavily on continuing to make money. They love their children but expect them to follow suite by pursuing money and making their own fortunes. When she became a nanny several years ago, they were less than thrilled. They were sure her interest in the job would fade, but Bonnie quickly learned that it was her dream job. She’s been taking care of a young boy while his single dad is at work. The more she’s drawn into the family, the more she realizes just how much of her heart she’s given to them both. It was awesome to get both of these great characters and story ideas while writing Marrying Chrissy. Normally, though, I tend to get my best story ideas at the weirdest times. Right before bed time, in the middle of the night, while driving the car, and while taking a shower are some of the most common times. What about you? 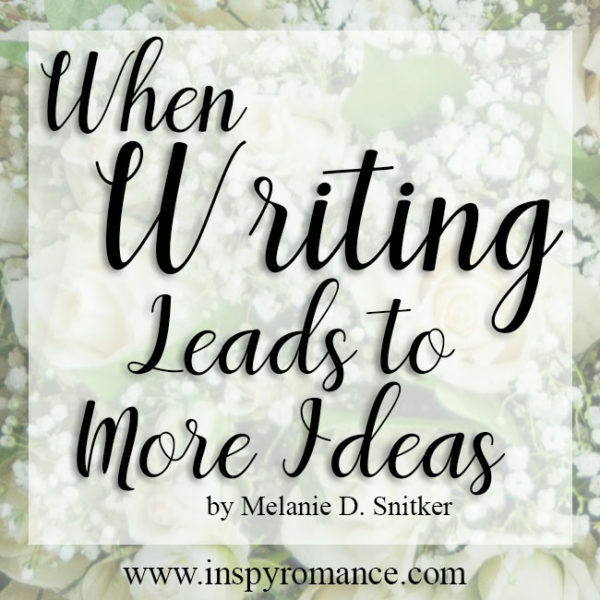 Do you get ideas or random thoughts at some of the oddest times as well? Or is your mind pretty organized? Comment below, and you’ll be entered to win a $5.00 Amazon gift card! This giveaway will remain open through August 26th. A winner will be chosen randomly and contacted on August 27th. I look forward to reading your responses! Marrying Chrissy is available for pre-order! Wyatt Tabor is feeling the pressure. His wealthy parents won’t support him unless he settles down and commits to the family business, while his ever-patient, loving grandmother longs to see him fall in love and be happy. After a broken engagement, he’s not sure he’s ready to trust someone else with his heart. With Gran’s 90th birthday party coming up, he cooks up a scheme that he hopes will appease his family and give her a drama-free celebration. Serving up coffee was never Chrissy’s idea of a dream job, but she’ll do whatever it takes to help her sister afford the medication she needs. When a handsome, smooth-talking customer offers to pay her to pose as his girlfriend, she can’t help but say yes. After all, it’s only for one night. What could go wrong? Wyatt and Chrissy soon realize their feelings for each other are anything but pretend. When family dramas and class differences pull them apart, they must decide whether to walk away, or take a leap of faith and risk everything for love. 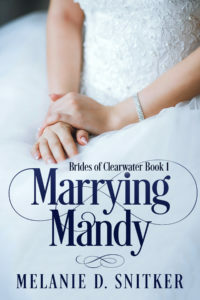 Marrying Mandy, for only $0.99 through the month of August. Mandy Hudson swore she’d never marry. Abandoned by her parents and raised by her grandparents, she has a hard time trusting that real love will last. When her grandmother dies, Mandy’s shocked to discover a stipulation in the will. Considering marriage to her best friend may be the only way to keep her family’s beloved bed-and-breakfast. The loss of his job threatens Preston Yarrow’s shaky financial stability. Besides, he can’t watch his best friend give up the only real home she’s ever known. Frustrated by Mandy’s stubborn refusal to let him help, he’s certain they are stronger together than they are apart. A marriage of convenience might be crazy… or an answer to both their prayers. Our 2018 Back-to-School Giveaway is now open! 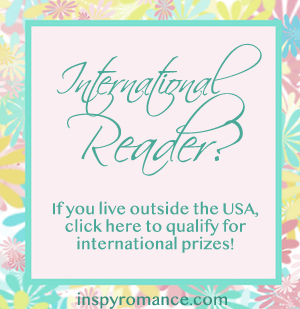 If you live outside the USA, you know how rare international paperback giveaways are. Well, here at Inspy Romance, we want to honor ALL our readers, no matter where you live. But, if we don’t know who you are, we can’t enter you in the international giveaway. Please take two seconds to fill in this form (even if you think we already recognize your name) if your mailing address is outside the USA. Click here. My mind tends to go off in tangents. Usually when I am out walking. I solve a lot of problems by letting thoughts drift through my mind. Walking is always a good way to get the thoughts flowing! Hi Melanie! I so get it. As a teacher, I would get my best teaching ideas in the middle of the night, in the shower, on my evening walk, or while driving to school – usually when I had no way to write it down. As a retiree, my random thoughts are different. Now during the middle of the night, I have the perfect statement for the book review I want to write or the grocery item, card, gift I need to purchase – not wanting to disturb anyone, I fail to write it down and by morning I have forgotten. The mind is a wonderful thing, but definitely works in mysterious ways. Thanks for sharing a little background of the next stories you are writing. I enjoyed reading Marrying Mandy. Best wishes. Oh I hate it when you think of something and then forget to write it down before you forget it. I’ve done that so many times myself lol You’re right, the mind works in very mysterious ways. I’m glad you enjoyed Marrying Mandy. I hope you’ll like Chrissy’s story as well. Hi, Melanie! I am wired that way too…. most of my ideas come to me in the middle of the night! I used to keep a pad and pen on the night stand, but now I just use the note app on my phone! Using an app on your phone is a great idea. What app do you prefer? Hi Melanie, thanks for sharing. I get thoughts/ideas at random times also, and have learned to keep a notepad/pen or my iPad nearby to jot down ideas. As a teacher, some of my best ideas have come at random times!! Using your iPad to jot ideas down is a great idea. I really need to put a notepad and pen by my bed and even in the car (to use when I park LOL). It seems I get my best ideas while showering. Before I retired, I got my best programming solutions while sleeping. But like Renate, they were gone by morning. My mind goes 90 mph most of the time. Thank you for sharing. Thanks, Lucy! Do you ever have trouble closing all the tabs in order to go to sleep? That’s one of my biggest problems. I get ideas at random times , especially sewing ideas. I like the dress on the cover for your new book. I enjoyed Marrying Mandy. Thanks for writing God bless! Thank you, Diana! I thought that dress was so pretty, too! I hope you’ll enjoy Chrissy’s story as well. Though not a writer, I do get ideas at random and crazy times in the day. Makes it interesting. Definitely makes it interesting! Do you have ways to jot down some of your ideas so you don’t forget them? I get random ideas at all times. Yesterday Inwas getting a crown done at my dentists and had an epiphany. I wondered seriously about having them stop and reach in my purse and hand me my phone so I could tap it in my Notes app. Oh, getting a great idea like that while a dentist is working on your teeth is horrible timing. I hope you remembered it all and got at least some notes written down once you were done! My mind is not organized! I think of things in the shower and while driving, not when I need to! I hear you! Wouldn’t it be nice if our brains cooperated more? lol Thanks for commenting, Katie! When I was younger, I was organized. Now I’m not. I’m looking forward to reading a book about Emma. Thank you for your kind post, Jackie! I don’t get random ideas, but I talk to God in the shower seeking answers. Not that I write books or anything, but I always get ideas, random thoughts ou remember something I have to do at the oddest times and when I can’t write them down. I end up usually forgetting it then…. Why is it the random thoughts or ideas always occur at the weirdest times? I’ve learned to have paper and pen handy when I’m having my morning prayer time, as I’ll think of people I need to contact, things to do, etc., while praying :-) Also, I don’t fall asleep very quickly most night, so do some praying then too, and often think of things I need to take care of. Instead of getting up, I usually just add on a prayer request that the Lord will help me remember the things in the morning. That’s a great idea, Margaret! Thanks for sharing! I also get inspiration when my left brain is tired. Which is weird to me. Right before bed is my best time, but I also have woken up in the middle of the night needing to scribble an idea down in the dark. Every once in a while I’ll get ideas when taking a shower, but I don’t think I’ve ever got any while driving. ;) But maybe because I’m usually belting out songs at the top of my lungs. LOL Nothing wrong with singing at the top of your lungs while driving! I usually get sentences for my book reviews when I’m in the shower! I have notebooks for EVERYTHING! A modern marriage of convenience would be very unique and interesting! Thanks for the post. I completely understand about having many notebooks lying around. It’s essential! I get my best thinking done while in the shower – as long as my kids aren’t coming in and out! I’m excited for Marrying Chrissy! I’ve read the other two books in the series already. My mind definitely bounces around so my idea come at super random times! I am looking forward to this next book!! Love the dress on your cover! I tend to “organize” while driving but then promptly forget half of it when I get home and want to write it down! lol I do try to “jot” ideas down on my phone when I think of them (but obviously not while driving). I wish I was a planner/plotter Melanie. But alas, I’m a complete pantser. I end up with side characters that were only supposed to have a tiny role and then they want their own spotlight. It works for the next book in the series, but sometimes, I end up jumping through hoops working with their backstory from the last book. The publisher I used to write for wouldn’t allow the heroine to have an abortion – even in the past and before they were Christians. So when I wanted to give a side character bad girl her own book, I had to work around that. Some hair-pulling moments enused, but I found a way. I do sometimes and they can make me laugh. I love to tell jokes and make people happy. I always dream of organizing my bookshelves in abc oder, so far that has yet to be done. Oh, bookshelves in ABC order sound like a lot of work but wonderful! I’m here to meet new authors and I’m super excited to have meet you. I can not wait to read your books. Thanks for sharing how you get your ideias. This is fun. I usually get my best ideas when I’m ready for bed, or on the road. Then I just write random comments in notes and try to not forget where I wrote them..
Hi Priscila! Oh, yes. Keeping track of where you write your notes is definitely another thing to watch for! Glad you’re able to jot them down when you think about them. always love meeting new authors when I was younger I felt I was more organized it seems since I have gotten older my mind goes in every direction Thank you for sharing! I find the same is true for me as well. I used to write everything down, and now I’m lucky if I consider doing that LOL Thanks for commenting! I’m a daydreamer. So my ideas flow all the time, day or night. But I like it that way. I also love both story ideas for Bonnie and Emma – they sound great. in the shower, while driving, when I’m trying to fall asleep–all times ideas or answers come to me.